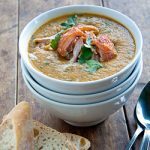 If you are a regular reader of my blog, you’ll know that 90% of the time I like to keep things simple and easy. There are times when I am more than happy to spend the whole day in the kitchen testing recipes and trying out the harder stuff, but most of the time, simple is best in my books. 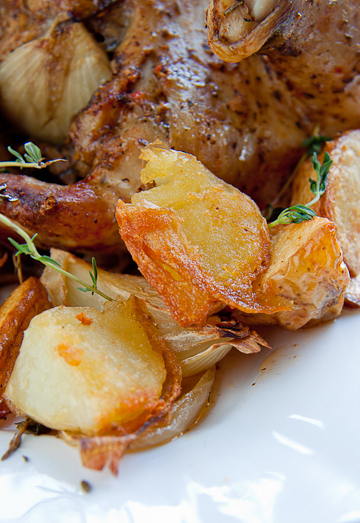 And there is no meal more delicious than a simple meal of really good Roast chicken with crisp roast potatoes. There is just nothing like it. The aromas wafting through your house while it’s in the oven will make everyone salivate and eating the juicy, flavourful chicken just warms every part of my body, not to mention how much it soothes my soul. 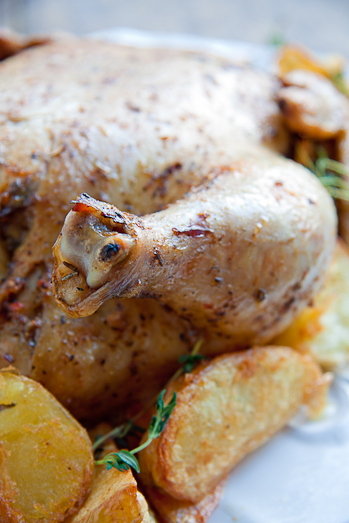 No matter how cold it is outside, Roast Chicken always fills my day with sunshine. With this chicken I kept it really simple, I always place an onion in the cavity as I just think the flavour it adds is incredible. But I did a very simple rub of some dried Italian herbs, olive oil and lemon juice. I always roast my chicken on a bed of chopped onion and carrots to add beautiful flavour to the gravy. I don’t have a recipe for my gravy as I just like to place the roasting tray on my stove, scatter some flour into the pan and allow it to mop up all the juices then stir in some chicken stock and allowing the flour to cook thoroughly. Season to taste and that’s it. Easy gravy. I served the chicken with the most fabulous duck fat roast potatoes. Let me tell you that there is nothing as delicious as a duck fat roast potato but I also know that duck fat is really expensive and not something that is easy to come by so I would suggest you roast the potatoes in half olive oil and half butter and add some garlic cloves for flavour, if you don’t have duck fat just lying around. To add some colour to our plates I decided to make one of my favourite side dishes, garlic-sour cream green beans. I don’t have a recipe for this as it’s something I just throw together but one day I’ll measure everything out and take a photo and will share it with you. Belive me, you want me to share it with you! Combine the herbs with the salt, olive oil,smoked paprika and lemon juice and rub all over the chicken. Season the cavity with salt & pepper and place the halved onion inside. In a roasting tray, place the quartered onion, fresh thyme, chopped garlic and garlic cloves then drizzle with some olive oil. Place the chicken on top of the vegetables and cover with foil. 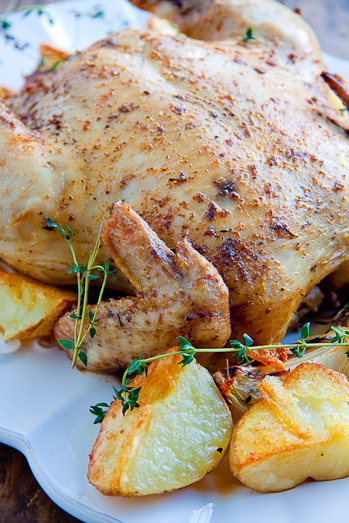 Place in the oven and allow to roast for 45 minutes – 1 hour until the juices run clear when the chicken is cut. Add the duck fat and the olive oil to a roasting tray and place in the hot oven for 5 minutes. Remove from the oven and add the chopped potatoes. Sprinkle the potatoes with salt and place in the oven. Allow to roast for 30-35 minutes until the potatoes are golden and crispy outside and fluffy inside. Makes me want to rush home and make a whole pan full of roast potatoes. Is duck fat available in our Supermarkets? Marilyn, I have seen duck fat at Woolies often, big tubs of it. Made your chicken on Saturday night and it was a huge hit! Ooooh, I love potoatoes fried in duck fat!!! Confit de carnard, yum,yum!! Sounds great, bu tell me, where do the carrots fit in the recipe? Ohhhh those potatoes! To die for!! Can’t wait for the green bean recipe! This really looks delicious!! I see Sam said that you can get duck fat at Giovanni’s! This looks stunning! Thank you! Just not sure where i’d find duck fat in PE? Gotta give this a try. Wow that looks insanely good. I havent had a good home made roast chicken for ages. I have also never had duck fat roasties before. Must rush out to Giovanni’s and get some. Stunning Ally! 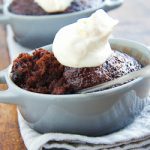 Alida, this looks and sounds divine – I am already craving it and it’s only 9am! 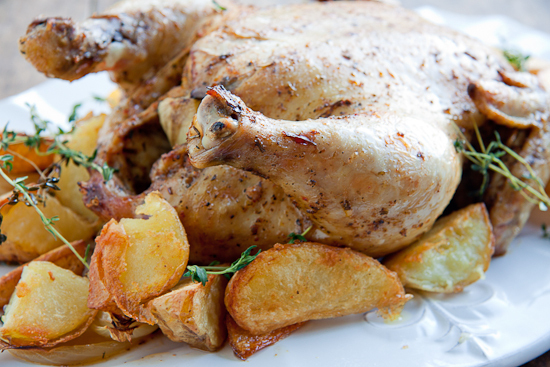 I love the simple way that you’ve prepared the roast chicken. Simple roasts are the BEST! Linda : I agree, simple roasts are always best.